Spider-Man has a large and distinguished rogue's gallery, but among his foes one relatively recent addition stands out, even among the classics - Venom. Once you've created a popular new villain, what better way to capitalize on it than to create what television producers lovingly refer to as a spin-off. Carnage is just such a creature, and he's a spin-off in not only the traditional sense but in an organic sense as well. Eddie Brock (the human host of Venom) was in prison, sharing a cell with one Cletus Kasady. The Venom symbiote had been removed from Brock (or so they thought), which is why they let him stay in regular prison rather than a special facility for super-powered criminals. The alien symbiote (Spider-Man found it during the Secret Wars and brought it back to earth) was still alive and it found Brock and helped him escape prison once they were reunited. Unbeknownst to Brock, his 'other' was pregnant and ready to spawn a child. Maybe it was Brock who had been knocked up, since he was in prison and anyone who's seen a few episodes of 'Oz' on HBO knows you don't stay pristine for too long. Regardless of who's responsible (they made a case that it reproduces asexually) the symbiote left a little present when they broke out of jail in the form of a small gooey glob. Cletus Kasady was in prison serving eleven consecutive life sentences for various murders, and he is very psychotic. If your name were Cletus, you'd be mad too. He grew up as an orphan and burned down the home for boys where he stayed when just a kid (after probably killing someone there) and combined with the power of Venom's offspring he went on a killing spree in New York. He didn't have the twisted sense of justice that Brock did, but just a lust for killing and a desire to satiate it. Once the two (symbiote and Cletus) are joined they form a new entity dubbed Carnage. The first name that creators David Michelinie and Mark Bagley came up with was Chaos, which was being used by another company. So they fell back to Ravage, which was being used by Stan Lee in his new Ravage 2099 book. After a few false starts assistant editor Eric Fein suggested Carnage, and the name stuck. Carnage is brutal and he seems to have greater strength than Venom and shares the ability to hide from Spider-Man's spider sense. Carnage's body is more liquid than Venom, and many tendrils radiate from his body that are useful for looking scary or dramatic, and killing people. Carnage is just a really cruel and mean guy with no redeeming features whatsoever, so naturally he's a popular villain. An interesting coincidence is that Carnage and Freddy Krueger both share the same colors (red and black). They are also both psychotic and evil, and they were both born in an institution. 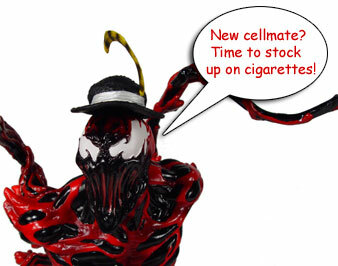 Freddy's 'dads' were the inmates at an insane asylum, while Carnage's 'dads' were the guys from cellblock B. Freddy has a glove with claws while Carnage has claws on his hands. The big difference is that Freddy always brushes after every meal and Carnage doesn't. Carnage may not be Spidey's most popular villain but he might be the most insane, and so Diamond Select Toys (DST) tapped Art Asylum to create a vision of both terror and beauty. The inmates designed and sculpted Carnage, and he is part of the Rogue's Gallery line of busts from DST. Previous Rogues were the Lizard and Sandman and the next will be the Kingpin. After that expect Kraven, the Scorpion and Carnage's big daddy Venom to join the ensemble. The bust is about six inches tall to the top of the head, and slightly taller with the tendrils that project out of his back. 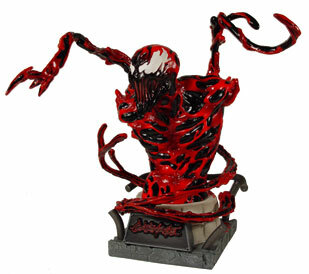 There are also tendrils that circle around carnage from out of the base, and the base is designed to mimic the look of a padded cell that Carnage has just escaped from. The base is a part of the overall design and the bent bars and padded look aid the bust in its aesthetic look. The front has a stylized logo on a nameplate, which finishes the design. All the busts in this line are designed in scale with each other and at a scale slightly smaller than the line of Ultimates busts from DST. This bust was limited to 6500 pieces and comes with a certificate of authenticity signed by Art Asylum President Digger. So far the series of Rogue's Gallery busts have been very impressive, and Art Asylum and DST have hit a home run with the line. 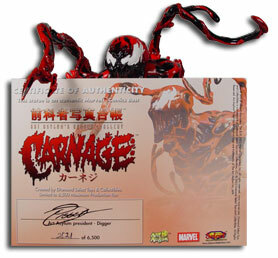 Where to buy the Carnage Bust: This piece is limited to a run of 6500, and you can find it at your local comics shop and various online retailers such as TowerRecords.com for between $35 and $45 USD.